Right mouse click on user/group in the selected red area this works for all tabs in the highlighted red box. 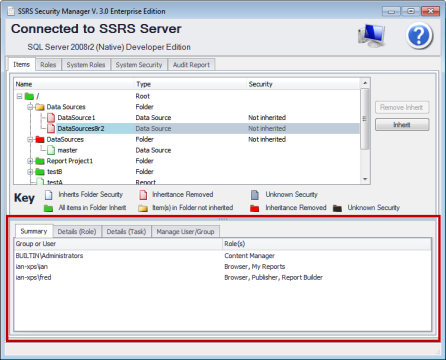 The first three tab in the highlighted red box (Summary, Details (Role) and Details (Tasks) are used to display security of the selected item. Right clicking a group will show the Group Information window. Depending how many users there are in the group this can take several seconds to populate. Notice the amount of users displayed. There is no limit on how many users are shown. 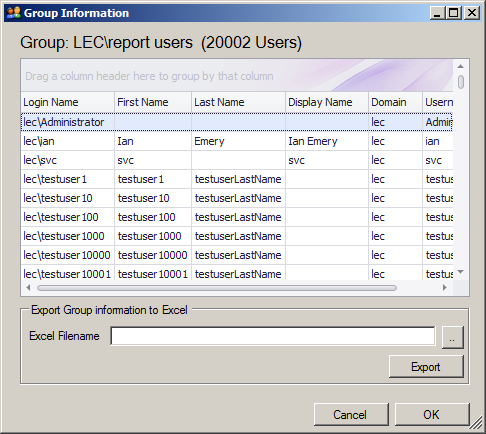 Grouping can be performed on any column. Simply drag the column header to the area above the column headings. In this example it is grouped by the domain. You can also have additional sub grouping- drag another column header. Sorting on a column is done by clicking the column header. Filtering on a columns is performed by moving the mouse to the top right of the column header a filter icon will appear, click on the icon. This information can be exported to Excel. 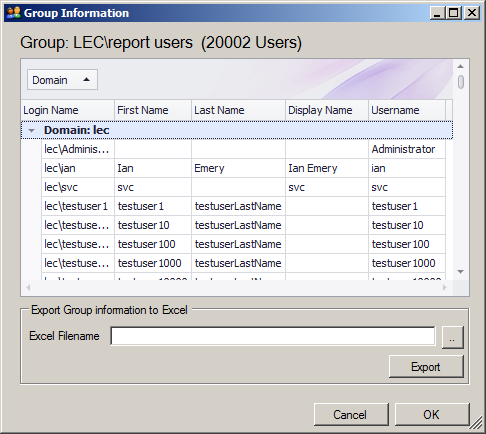 The export will be in the same structure as the Group Information window eg. Column grouping will be preserved.